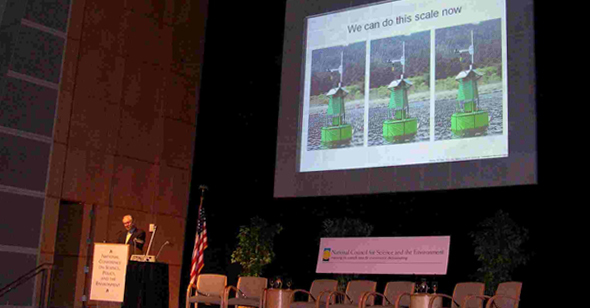 NSF Director, Dr. Arden Bement, recently lauded the LTER in an address to the National Council for Science and the Environment's 5th National Conference on Science, Policy and the Environment "Forecasting Environmental Changes" in Washington, D.C.
NSF Director, Dr. Arden Bement, recently spoke to a large audience of scientists and policymakers at the National Council for Science and the Environment's 5th National Conference on Science, Policy and the Environment, in Washington, D.C. Bement featured the LTER network prominently as he addressed the theme of the conference, "Forecasting Environmental Changes." He presented research activities of several LTER sites, spoke about LTER reflections from several Principal Investigators, and highlighted the children's book from Niwot Ridge (My Water Comes From the Mountains) when talking about environmental education and public outreach. His speech also covered other NSF-funded research, cross-agency initiatives, earth observation systems, cyberinfrastructure, environmental education, and future foci for U.S. science. "I have titled my talk today "From New Sight to Foresight: The Long View on the Environment." This sums up our evolving vision of environmental research and engineering at the National Science Foundation. "Foresight means the "perception of the significance and nature of events before they have occurred." Another definition is "care in providing for the future; prudence." Both definitions inform the National Science Foundation's role in environmental research and education. "At NSF we embrace three aspects of environment: the natural, social and constructed environments. Insights into all three comprise our ability to perceive, and to provide for, our future. "I've also mentioned "new sight"--by which I mean the expanded vision bestowed by vast observational networks and breakthroughs in sensors. Development of these tools is part and parcel of our ability to foresee. "Then there is the "long view." Some of you will be familiar with NSF's Long-Term Ecological Research Program (or LTER), now celebrating its 25th anniversary. But how many have heard of the "Long-Term Ecological Reflection" Program? A participant in this Oregon State University venture, essayist Robert Michael Pyle, contemplated beauty and decomposition at an LTER site deep in a forest of the Pacific Northwest. "Musing over the unhurried pace of decay and regeneration in the forest, he observed that "Most of us take the short-term view, most of the time." The long view, he noted, "requires faith in the future -- even if you won't be there to see it for yourself." In NSF's approach to the environment, we are constantly stretching that view, across disciplines, across time and across space. "For almost two decades, NSF has supported major, cross-disciplinary efforts on the environment, ranging from global change -- initially focused on physical science--to biocomplexity in the environment, grounded in biological science but involving all disciplines." 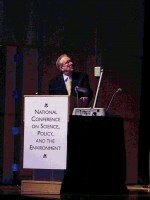 Read the full speech at http://www.nsf.gov/news/speeches/bement/05/alb050204_ncse.jsp.